We’re back with another podcast, and this time we’re coming back to the studio production of The Passion of Frankenstein. Remember, you can get this production in all its glory, with CD quality sound instead of the heavy compression we put on the podcast tracks, right here! 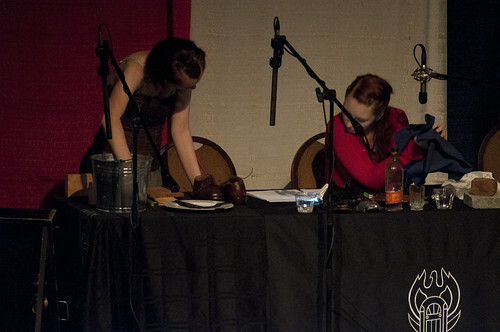 Also, just like the last time we used the studio production, we have no photos from that show, so we’re bringing you more from the LibertyCon show. The LibertyCon cast for Frankenstein! 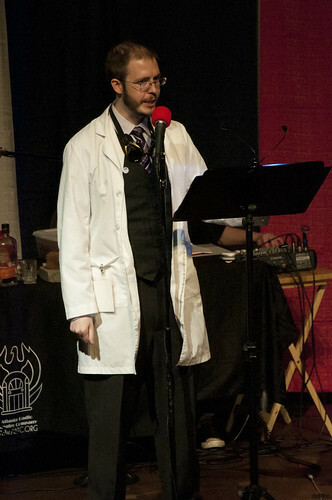 Matt Goodson as Dr. Victor Frankenstein. Where did he get his PhD, anyway? 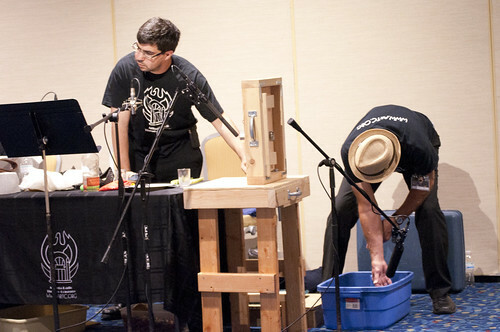 The best Foley team in all of existence. In this case it’s real FrankenFoley! As we mentioned last month, we’re bringing you The Passion of Frankenstein in five parts and will be showcasing a different performance for at least the first four. We hope. We haven’t performed two of these yet and if the recording devices fail (it’s happened) then we might have to improvise. Part five will probably include the best performance of those scenes, but who knows? We might surprise ourselves. This month we’re bringing you a section of the studio recording that we did at Audio Craft Studio back in 2002. This is what we refer to as the “original cast”. 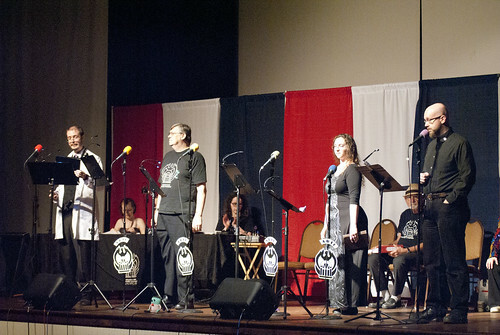 The pictures in this entry are still from World Horror Convention 2015, though, because we don’t have any pictures from any of the other performances yet. Talk to us after LibertyCon and Dragon Con. So the picture below of Thomas E. Fuller and Henry Howard at Audio Craft will have to do. The studio recording was, literally, a monster to produce. The rich soundscape we talked about in last month’s entry is difficult to produce live, but surely in the studio it’s easier, right? Wrong. What do you mean it’s not easier?? 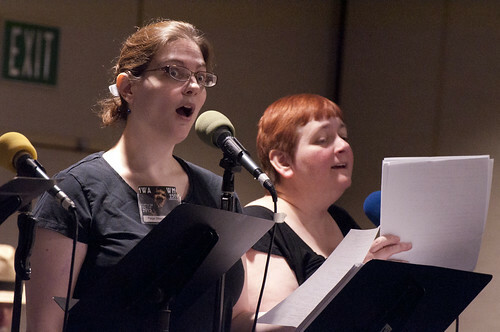 First, in the studio the standards are higher. Live audiences are very forgiving (thank goodness! ), but once it’s on a recording all the little flaws stick out, so there’s a lot of precision work that has to get done. And the music, which in a live performance has a little bit of ebb and flow and adjustment to it, had to get timed out to the second to make the scenes work the way they were supposed to. And then there was the review process. See, this was back in the early 2000s when the Internet was only barely a thing for the general public. Cloud storage didn’t exist. Websites were hosted on Angelfire and Geocities. And CD-R technology wasn’t even remotely as reliable as it is now. We couldn’t just create an mp3, put it on a server somewhere, and have beta listeners download it and give feedback. We had to try to gather everyone together at the same time and have a listening party. On one memorable occasion we had all the relevant parties in the room…and the CD wouldn’t play. And burning another one would have involved an hour of driving and probably 30 minutes to actually burn the disk. So we all went home.